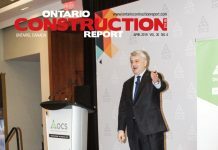 Ontario Construction Report in c0-operation with the Carpenters District Council of Ontario has published a comprehensive 20 page supplement. You can read it online by clicking on the image below. Ontario’s Carpenters Union traces its history to the earliest days of North American organized labour – its first Toronto and Hamilton locals were established in 1882. The union has thrived through more than 132 years by adapting and enhancing its services, retaining progressive social and community values and embracing technology and healthy employer relationships. Today, the union, represented provincially by the Carpenters District Council of Ontario (CDCO), has about 22,000 construction members at 16 locals throughout the province (the union also represents some allied trades and non-construction carpenters, bringing the total membership to about 25,000). Its training and benefits programs are among the best in the industry. The union has not lost touch with progressive social values, supporting low-income community pre-apprenticeship programs such as ‘CHOICE” and military veterans through the Helmets to Hardhats program. 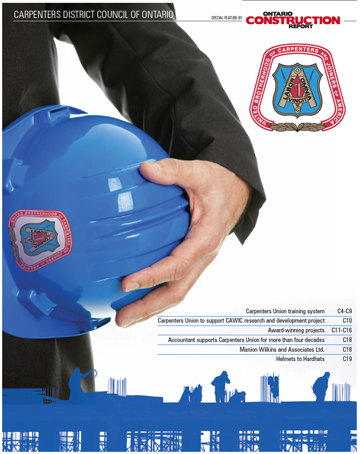 The union also has great training partnerships such as OYAP (Ontario Youth Apprenticeship Program) where they are aligned with school boards throughout the GTA, and has linked with organizations such as CBTU (Coalition of Black Trade Unionist), and CAWIC (Canadian Association of Women in Construction) to reach out to individuals looking for career opportunities in Ontario’s vibrant construction industry. The result: union members enjoy financial stability and a quality of life allowing them a secure working career/retirement, while the Capenters Union improves the quality of life for many who would otherwise be disadvantaged. Employers, meanwhile don’t need to worry about work stoppages – there hasn’t been a strike/lockout for almost three decades, and recent collective agreements have incorporated a no strike/lockout arbitration process known as the “Provincial Protocol”. 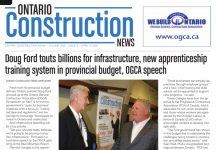 “The contractors are our partners in this industry and even though we have the occasional disagreement we always agree on a few items: jobsite health and safety, skills development and training and high productivity delivering excellence are all top priorities,” said Tony Iannuzzi, the CDCO’s executive secretary treasurer. 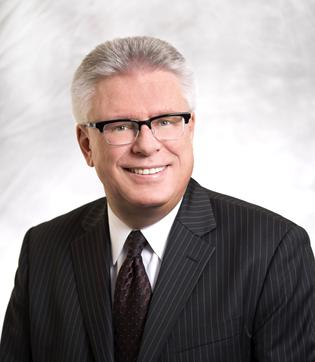 In fact, relationships with employers are collaborative enough that, while Jim Vlahos, the former long-time Carpenters Union counsel has become the labour relations director for the General Contractors Section of the Toronto Construction Association, he remains on good terms with the union and other labour organizations. This doesn’t mean that union and management representatives won’t speak for their own interests – but both labour and management realize that labour stoppages are harmful to their interests, especially when construction service purchasers want to be sure that their work will be completed reliably and on schedule. The union enables contractors to mobilize highly skilled workers as required, even for the largest and most challenging projects, many of which have received prestigious awards for their design and construction quality. The carpenters’ training program adapts to employer requirements. Today members are working on massive solar energy projects and developing bridge and infrastructure construction skills. These training investments are significant – members pay a $1.00 an hour check-off to support the training program. When such careful work is done not only to build a new legacy but to preserve what’s here from the past, it’s something that citizens, communities, and organizations alike are thrilled to see. “We have great respect for tradespeople who work to preserve the built environment of the past while moving into the future. Their hard work makes Ontario’s cities beautiful and liveable and enjoyable for us all,” says Heritage Toronto’s director of marketing Stacey Fowler. 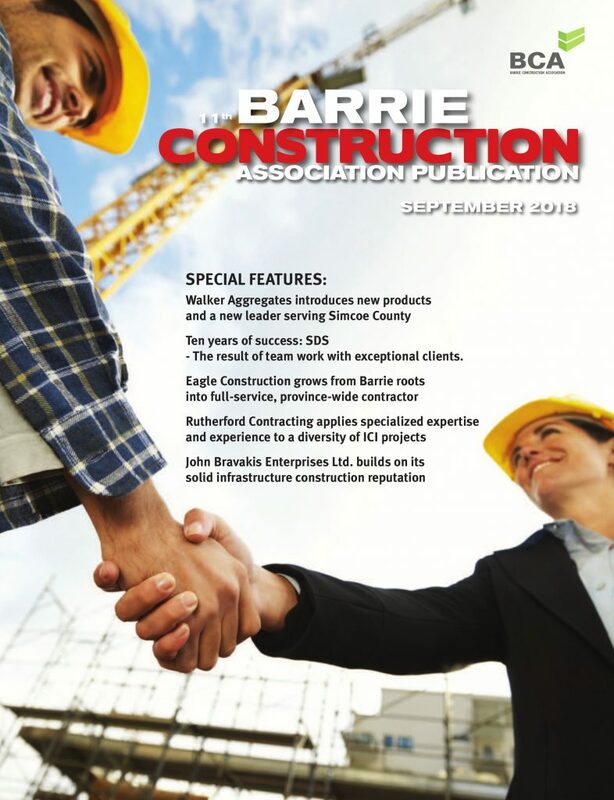 You can read about some of the Carpenters Union’s achievements and initiatives in this special report, and learn more at www.thecarpentersunion.ca, www.carpenterslocal27.ca and https://www.carpenterstraining.ca.